Shoe designer or music producer – these were the two occupations that the 15 year old TiL Schneider could imagine for his future professional life. 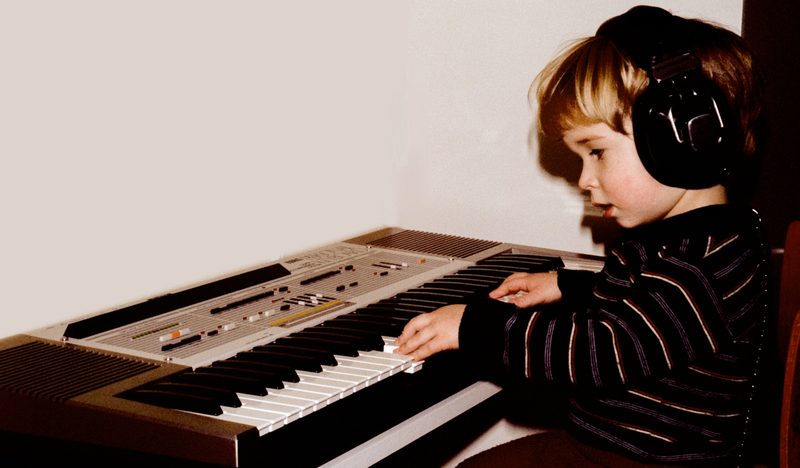 That he has chosen music, is at last because of the musical environment in which he grew up. When TiL wasn’t climbing trees or lenting self-recorded video cassettes to classmates for a fee, he sat at the piano or worked on techno sounds on his music workstation – his pride and joy. Music was always present In the parental parsonage – in the living room all kind of songs were hummed and in the basement he tested and tried on grooves together with his 2 younger brothers until all neighbors knew the difference between Dr.Dre and Daftpunk. Only at the age of 17 years TiL began to learn to play the trombone together with his father. He loved to practice all by himself in the empty church. Very soon he played faster and louder than his father and started to please not only the church’s trombone choir but also the local brass band. After high school and a year as a community service in a kindergarten TiL decided – since he has always been fascinated by beats and synthesizers – to start an education as a sound engineer. During the following jazz studies with his main instrument trombone at the Academy of Music and Dance in Cologne, he set up his own brass band Brass Action Heroes. Since there was no suitable sousaphone player around, he learnt to handle the „Big Lady” on the spot. In order to play in the complete wind section by himself, he also became friends with the trumpet. In a flat he shared with musicians in Cologne-Kalk he lived with his future band mate Lutz Streun ( Three Fall ) and formed with him the horn section for various bands (including Sindikaat, Dickes B, Coco Road Show, La Papa Verde, Pelemele, Paco Mendoza, Don Abi). After moving to the south of Cologne in a flat in which except of electricity nothing really worked, TiL started to build his own studio and produced soul, reggae and hip-hop vocalists (including Fleur Earth , Rachel Scharberg , Alice Francis , Raggabund , Doc Dondo , Mirko Polo, Akua Naru and Tim Plus). He played and performed for the solo project of Seeed-frontman Dellé in many major concert halls and at festivals. TiL also performed on the occasion of the Football World Cup in South Africa. Since 2011 TiL Schneider works in his now fully equipped studio in central Cologne with a magnificent view of the Cologne Cathedral. Quite frequently you can see him ‘live’ on stage with his exceptional trio Three Fall. With “Three Fall” he was on extensive tours through Germany, the Netherlands, Austria, Spain, Poland, Egypt, Korea, Japan, China, and Russia in recent years and released three albums (two of them with ACT Music). Together with his younger brothers TiL produces as Tailormade Brothers Instrumental HipHop and sometimes Cologne Rap (Kölsch Rap) – but in the meantime no longer in the basement, but in his studio. 2015 he founded his label Tailormade Music. The trademark of Tailormade Productions – to put brass instruments with their different acoustic colors into a contemporary context – is the central theme by the releases of this label.